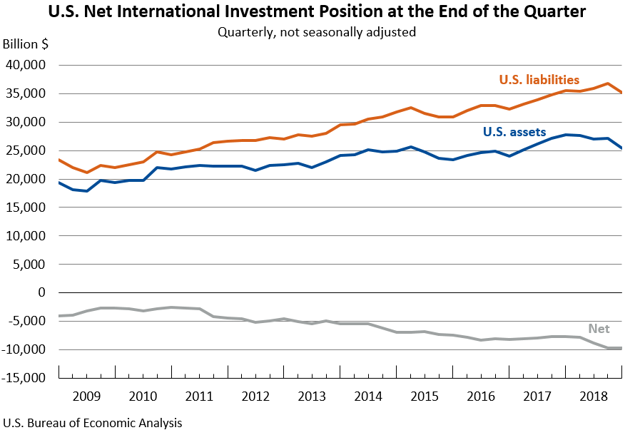 The US posted another decline in Net International Investment Position, bringing it to negative $9.717 trillion. Decades of negative trade and current account deficits are the reasons for the current net investment position we have today. The dangers of this trend are unsung. 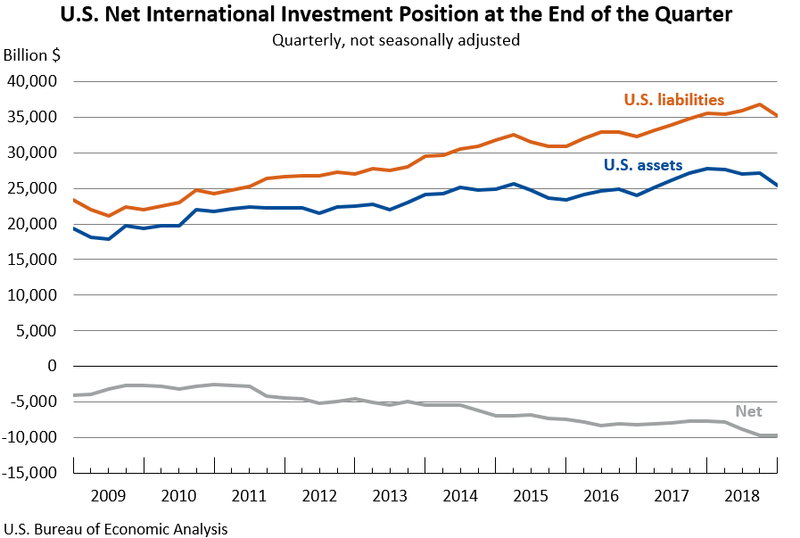 The Net International Investment Position, herein, NIIP, is one that gets very little news or analysts attention. This is probably true because it hasn't really ever affected the economy in a negative way, noticeably at least. I only became aware of it myself probably about 6 or 7 years ago. I've been paying attention to it ever since. As of 2018, it is down to -47.4% of our GDP. the economic theory that trade generates wealth and is stimulated by the accumulation of profitable balances, which a government should encourage by means of protectionism. You'll come to learn that we have failed to learn this particular definition in America. It is the balances of trade that will lead to distortions in a country's NIIP. What we must focus on, however, is what is known as the current account balance. The current account is not just the trade balance of goods and services being exchanged. It also includes monetary transactions like dividends being earned overseas and sent back to the US investor or dividends earned by foreigners and being sent out of the home country. The current account also includes what are called remittances. Let's say an American goes to work in Japan for a year and earns a salary of $100,000 USD; he or she may well send a good portion of that back home to their family in the US. Same goes for people who come to the US, legally or not, work and send their money back to their home country. Add up all these balances and you get a net current account balance. Note: The terminology and semantics with respect to these various measures of trade balances can get tricky. Net measure of transactions between the United States and the rest of the world in goods, services, income, and current transfers. That, more or less, is the main source of our NIIP predicament. It has been with those dollars, that instead of buying goods and or services from US workers, they instead bought our bonds, our houses, our hotels, our utility companies and shares of our public companies as well. Hence, Americans collectively own about $25 trillion in foreign assets while foreigners own collectively about $35 trillion in US assets. I keep thinking about this concept that I read in Peter Bernstein's book, "The Power of Gold, A History of an Obsession," wherein he continually refers to this story told by a man 100+ years ago named John Ruskin. The story goes that a man boarded a ship carrying all his wealth in a bag of gold coins. As the ship was at sea, there was a storm and the captain ordered everyone to abandon ship. The man then strapped his bag of gold coins to his waist and jumped overboard... and sank directly to the bottom of the sea. Ruskin would ask: "Now, as he was sinking, had he the gold? Or had the gold him?" The strength of the US currency relative to that of our trading partners has played a key role in how we got into this predicament of having such a large negative NIIP. When I worked in manufacturing from 1999 - 2004, just as China entered the World Trade Organization, the pressure was on to figure out how to compete with their substantially cheaper labor force. My company invested in opening a plant in the Philippines. We would bring over 100s of our future Filipino workers to the US to train. At the time, I was working as a technical service engineer and was making about $180 a day. The folks we trained to do my job earned $8 a day. We still failed and China basically became the manufacturer of the products we made as most of the domestic supplies folded. I later learned that many of the Filipino engineers we trained went on to China to work there in the same field. The problem with having a strong dollar makes foreign labor costs that much more attractive to let them do it. The current account balance started to tank in 2000 and has since remained very large with no signs of improving. A lot of what happened was we outsourced a tremendous amount of our goods, producing jobs overseas. When I say outsourced, I mean that US buyers would instead find suppliers overseas vs. domestically. The domestic companies would then fold in most cases. Even with clothing, in 2000, America still produced 29% of the clothes we bought domestically. By 2013, it was down to just 2%. These jobs were not lost to robots or automation, they were lost to the rest of the world. In 2008, Hershey Chocolate moved their production from Hershey, Pennsylvania, to Mexico. We let someone else do it and simply give them our dollars in return. Remittances is another financial statistic that plays a big role in our negative current account balance. Remittances are money that is sent back to one's home country and out of the country where it was earned. In 2017, foreigners sent $148.489 billion out of the US and back to their home country. Meanwhile, $6.621 billion would be sent into the US from outside the country. This net difference of $141.86 billion is part of the overall deficit of $472.5 billion in 2017. That comes to 30% of the total deficit in 2017. We are at a point now where the difference in assets has become so large that the capital account, which is interest on debts and dividends on stocks, for example, will continue to feed itself and grow even larger into the coffers of the rest of the world. Interest on the Federal Debt that is foreign-owned is tax money that simply leaves the country. Remittances are only going to continue to favor the rest of the world. Trade of goods and services will also be very hard to balance, but is playing less of an important role as the capital account and remittances become bigger factors in the overall current account balance. The paradox is our strong dollar. Are we sinking to bankruptcy to the rest of the world? Have we the strong dollar? Or had the strong dollar us? There is a lot of money that simply leaves the US every year. That is money that is not getting invested domestically. At a minimum, put this financial data point in the back of your head as it's going to begin to play a bigger and bigger role with respect to both our fiscal policy and Fed policy too. It'll probably make the response to the next recession or financial crisis less easy to deal with. QE will be more impotent as more and more money leaves the country to our foreign owners.